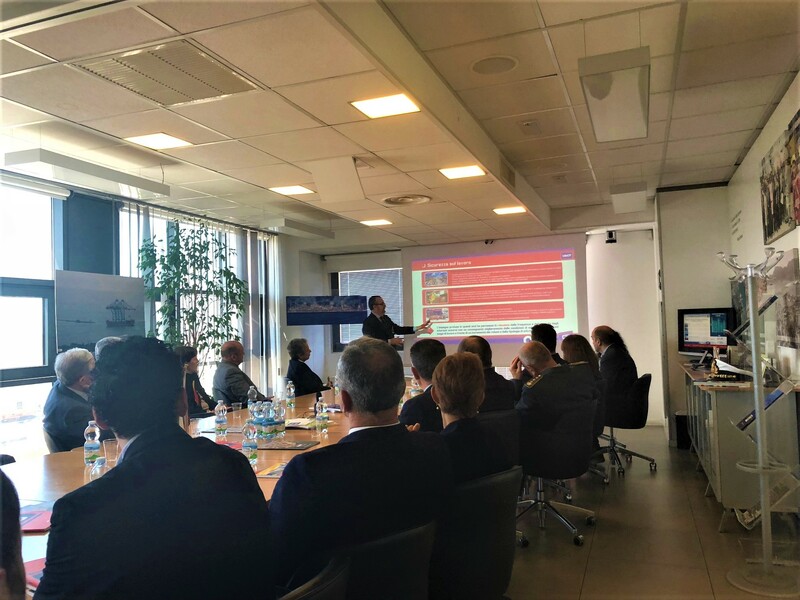 On Friday March 25th 2018, Antonio Davide Testi, General Manager of La Spezia Container Terminal, held a speech in front of several representatives of local, regional and national institutions, where he presented an abstract showcasing the different actions that Contship Italia Group is undertaking in La Spezia to grow sustainably and responsibly. The presentation starts by underlining the growth in volumes witnessed by La Spezia Container Terminal, which boasts a +17% compared to 2016 and a +63% compared to 2001, with a compound annual growth rate of 4%. Consolidation of shipping lines and the new Alliances scheme in the recent period has led to an enormous growth of the average size of container ships calling LSCT – the first terminal in Italy to welcome 14,000 TEU ships in 2011, and regularly operating ships that carry in excess of 16,000 TEU, since 2015. Testi highlighted the efficiency of operations at LSCT - which are result of know-how and the ability of exploiting and optimizing available space and container turnover - but are also result of the intermodal and so called RAILability of the “La Spezia System” that allows fast and efficient processing of handled volumes on the numerous intermodal connections towards the main Italian and European rail hubs, thanks to valuable collaborations with freight forwarders and local institutions that make up La Spezia’s local system community. The growing need to integrate these sustainability and efficiency practices, which aren’t necessarily contrasting, but rather complementary, pushed the terminal towards developing and implementing an integrated Quality, Safety and Environment system, which is active since 2009. Furthermore, the system embrace ISO 9001, ISO 14002 and OHSAS 19001 standards. Antonio Davide Testi therefore showcased the different projects and the specific actions that are taking place to better deal with environmental issues such as grenhouse gasses emissions, water and waste cycles, energy consumption and noise emissions. With regards to acoustic emissions, the presentation underlined that in LSCT the phenomenon is being studied and dealt with smart countermeasures, since 2004. These routine and systemic measurements have been adapted to the change in business and operational dynamics over time, and through a careful evaluation of the causes and the origin of the noise sources, mathematic propagation models have been developed – models which are critically necessary to test new and modern solutions that can be developed with the collaboration of suppliers, equipment producers, researches and independent experts. Through development and application of “silent blocks” (suspensions which are installed on angular blocks of vehicles to reduce sound on impact while loading containers), soundproofing filters and enhanced suppressors (which reduce sound emissions of RTGs), detectors with specific high, multi-tone frequencies (less disturbing from a distance) and soundproofing barriers, noise reduction measures have been taken, and will continue to be developed. Antonio Davide Testi underlines (in addition to all monitoring and research activities which are taking place to deal with sound emissions, water and waste cycles and energy consumptions) the important results that have been reached as part of the PM10 particulate reduction project, which has been greatly reduced thanks to the BIOFIX treatment - an organic fixative that captures and fix to the ground, several micro-pollutants present in the atmosphere. Another important achievement is the saving in CO2 equivalent emissions, which have been reduced by 2% in the last two years – even when volumes managed in the terminal have increased by 17% – or the construction of a waste-waters recycle plant (which processes waters used to wash the operating vehicles) or again, recycling of paper (more than 10 tons collected in 2017 alone). Positive results also in the reduction of workplace injuries – both in terms of entity of injuries and frequency. Important results, which are direct consequences of constant monitoring and following of the OHSAS 18001 guidelines, that impose strict attention on risk assessment, identification of protective and preventive measures, implementation of surveillance and control systems, critical and timely analysis or incidents and immediate action through risk mitigation involving both personnel and specialized institutions for constant improvement. The keynote continued, bringing up the “2018 Action Plan” that also focuses on company welfare. A project which was launched in 2008 and reinforced today thanks to advanced technological opportunities that allow rapid access to more information, notifications, contact modules and offer one click - user friendly tools to request specifically tailored welfare services; all these initiatives are constantly under development and are aimed at improving work-life activities and weaving a network of service suppliers for the workplace community. To end the speech, focus was shifted to the terminal development plan, that will see La Spezia Container Terminal capacity developed to reach a throughput in excess of 2 million TEU a year, with around 50% of volumes transferred via rail – another step towards sustainability and reduction of road congestion in the surrounding areas. On the margins of the meeting, Testi commented “These kinds of round tables are extremely important for us, because - on one hand - they allow us to give value and showcase, with facts and figures, the commitment that La Spezia Container Terminal and Contship Italia Group are putting in all that is related to corporate social responsibility and conciliation of terminal operations with quality of life in port cities. On the other hand, these meetings are “platforms” that allow us to interact with local and national institutions, collecting feedbacks from all stakeholders with whom we can work to bring priorities into focus and understand the most efficient and valuable actions to safeguard the common good.